The bible says to love God with all our heart, mind and soul. We need to examine ourselves to see what is getting in the way of loving God. The more we love God the easier it is to pray and obey. When missionaries face persecution they will stand stong in the faith. Pray for salvation of the lost. 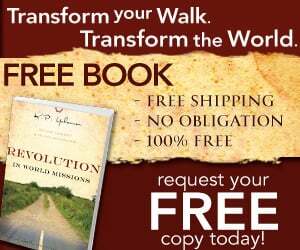 Revolution by K.P Yohannan is an excellent book on missions. You will be challenged for sure. To get a free copy click on the icon.